If you follow my Facebook page or Instagram page you will see how much I love coming up with new and different projects. If you don't follow me, you really should!! Yes, I am a sign maker/painter... but seriously, how many signs can each person have in their homes! About a year ago, I started looking for other wood projects or projects that would look good in wood and are easily painted/stenciled in class. This one happens to be one of my favorite new projects - they are called Noodle Boards, or you can find them under stove top covers. I'm pretty sure they were called noodle boards back when my grandmother rolled out noodles (which, by the way, I do roll out my own noodles too). That's for another post. This board is 21" X 31" and fits perfectly over my four burner gas stove. If you google it up you'll see all kinds of examples- some with handles, with little feet and even with a board around three sides, I'm assuming to keep the flour from pushing off when your rolling out your noodles. I painted this with five colors in acrylic paint - turquoise, bright blue, dark gray, cream and khaki. I stenciled the floral image in dark gray & the words in cream. Interested in a noodle board, reach out to me... we do custom pieces. 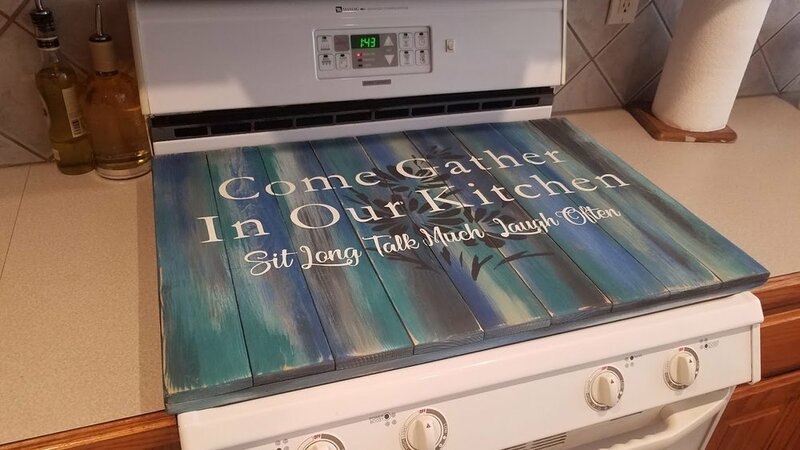 If you live in Oklahoma, we offer these in our Wood Sign Painting Parties.